Is it possible to build a silent, portable DAW that’s powerful enough for gaming? That was my quest… and I’m up and running on that impossible system! I decided to start with silent and portable. For that, I’d need a fanless laptop with enough power to record and edit audio without getting bogged down. That narrowed the field quite a bit. Aside from Chromebooks and tablets, there were only a few machines that met my specs. 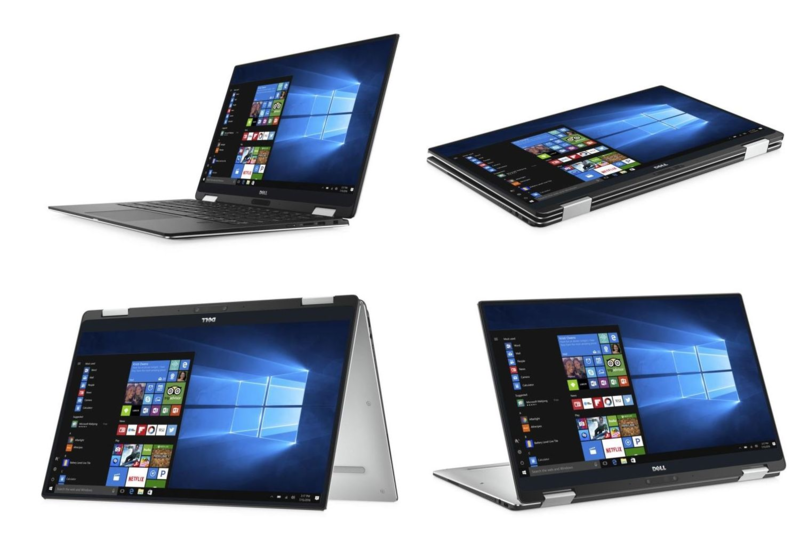 I chose the “Dell XPS 13 2 in 1” for the base system. Please note: only the 2 in 1 model is fanless and truly silent when running. Very important when I’m in the booth. It also has 2 USB-C Thunderbolt ports, which will come into play for the next parts of the “Impossible VO Machine”. To handle the demands of a true gaming box, I’d need a higher power graphics card than any silent laptop could offer. For this, I researched External Graphics Processing Units (aka: eGPU). They’re basically a high-end graphics card with a power supply and fans in a separate box. Most also require a high-speed interface. This is where the Thunderbolt ports come into play. I chose the “Gigabyte AORUS Gaming Box 1070” with an included Nvidia graphics card built in. 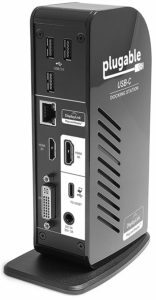 It works best with machines where the Thunderbolt port runs directly to the main processor (as opposed to thru the chooser). The laptop I picked is just such a machine. With all the essential components in place, I still needed some additional ones to round out the system. The “Plugable USB-C Triple Display Docking Station” works through the Thunderbolt port to provide power and adds usb ports and external monitor interfaces for daily use. I already had an external HDMI display, USB hub, wireless mouse and keyboard. Add to that the audio components (Focusrite Scarlet 2i2 interface, microphone, monitors) and the total package was complete. For my daily use as a DAW, I’ve got the USB hub connected to the USB-C port, with connections to the mouse/keyboard, Focusrite, etc. The USB-C Thunderbolt port is connected to the Plugable docking stations, which provides power and access to the external monitor. When recording, I use Sony Sound Forge and Sony Music Studio. Video editing is done with Sony Movie Studio. The system runs like a champ. Silent and powerful. When I want to do some gaming, I disconnect the Plugable docking station, and plug the Aorus Gaming Box into the Thunderbolt port. 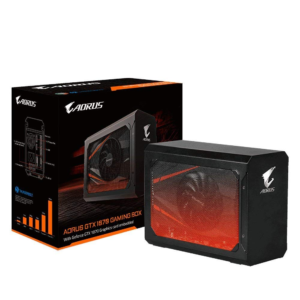 It also provides power to the system and connects to the larger external monitor for gaming. The fans are not bad, although too loud for recording. But the eGPU has more than enough power to run all the games I’ve tried so far without lagging behind. Truly awesome! I’ve also used the eGPU when editing video and rendering animation. It really cuts down on the time needed by taking the load off of the laptop cpu for any graphics operations. To switch back to DAW mode, I need to select “Disconnect GPU” from the tray app, then swap the Aorus out and plug the Plugable dock back in. Very easy to do. No system, especially one with this number of components, is without problems. Early on, the Dell Laptop had 2 issues that I’ve found work-arounds for. The first has to do with using Hibernation mode. Dell was initially not happy with it, and would periodically shut down without notice when in Hibernation. I managed to find a fix for that online that involves clearing out the old Hibernation data. The second issue was more problematic for recording. The laptop internal speakers would sometimes make burbling noises even when nothing was playing. I suspect this has to do with a driver or design issue. Since first purchasing the system, there have been several driver updates. This seems to have corrected the problem. Should it re-occur, I did find a work-around: just disable the internal speakers. (I wasn’t using them anyway – just my monitors and headphones). So… “The Impossible VO Machine” proved to be quite possible. There are some compromises, but that is always the case. The pricing for all the components is also higher than a normal DAW. Overall, I’m very happy with the end result. It allows me to record, travel, and game… all on one system. This entry was posted in Business, Do-It-Yourself and tagged Business, Computer, Joe J Thomas, JoeActor.com, Voice-Over by Joe's Dump. Bookmark the permalink.